Although nearly every home has a driveway, very few have one that adds curb appeal. Most driveways are either asphalt or concrete…a plain, solid colored area used every day, but noticed by none. Many people incorrectly assume that a driveway has to be plain, that adding any decorative elements is too costly or not applicable. But today's concrete isn't boring, nor is it too expensive, nor is it limited in options for sprucing up the entrance to your home. Decorative concrete is one of the most reasonable ways to instantly add curb appeal to your home. No matter what the style of your home, there is an astounding array of choices for adding color, pattern, and texture to your driveway. Concrete also offers a number of advantages that other paving materials can't match. It's available in a variety of patterns and colors, it provides a long-lasting surface that requires little maintenance, it can be customized, and it can provide the look of natural materials at a fraction of the cost. 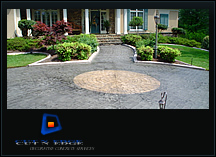 Another benefit of decorative concrete is that its effects can be applied to new driveways or to existing driveways. With a new driveway, there are options for adding color or pattern when the driveway is being poured. However, if you already have a driveway, you can still give it a decorative makeover. There are a variety of products and methods that can be applied to existing driveways to rejuvenate or resurface them. 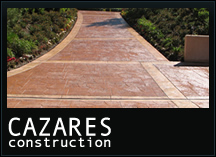 Learn about all the decorative ways you can enhance your driveway, then use our directory to find a contractor in your local area who specializes in installing concrete driveways.